30%OFF for Rental Rate in March 2019. Also 20% OFF for Rental Rate in April and May 2019. - Fully-equipped kitchen with stainless steel appliances? - Ideal for two couples or a family traveling together? We value life of you, your family, friends and anyone whom you allow into this property. PLEASE BE AWARE THAT ?LANAIS WITH RAILINGS THAT ARE 4 OR MORE INCHES BETWEEN ARE NOT RECOMMENDED FOR TODDLER AND CHILDREN. KEEP YOUR TODDLERS AND CHILDREN AWAY FROM THE LANAIS AND KEEP THE LANAI DOORS LOOKED AT ALL TIMES!! 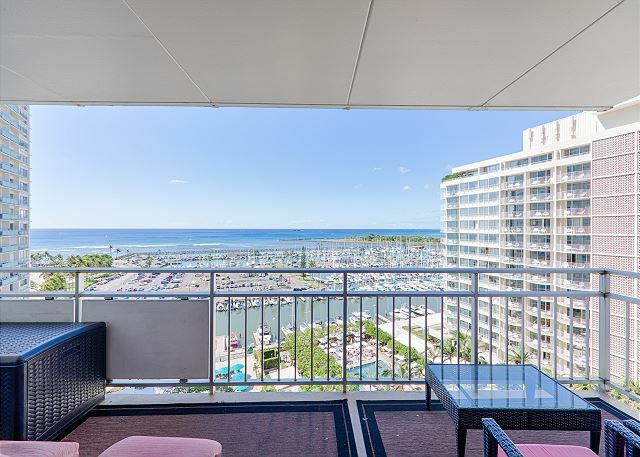 Breathtaking marina, ocean and sunset views from this Oceanfront two bedroom/two bathroom unit in the iconic Ilikai Apartment Building. This unit was recently remodeled and transformed into a ultra-trendy, modernistic room worthy of a 5-star rating. Quality textiles, including a fully-equipped, gourmet kitchen with modern white cabinets, lustrous counter tops, white stainless steel appliances and an expansive counter top, white marble flooring throughout the main living areas and tan/brown marble accentuate the warmth and tranquility of the bathroom spaces. Sliding mahogany doors provide you with seclusion while in the bedrooms. Perfect for entertaining or just hanging out with family. Lighting and abstract art provide a trendy feel. Watch for the green flash as the sun slowly hides behind the glistening pacific ocean horizon at sunset, all while you relax and sip on a glass of wine. Paradise, what a feeling! Please check 360 interactive tour! -> You can find interactive tour URL on Japanese web site. Please click Japanese flag. There is top right corner. A washer and dryer are conveniently located on each floor, and an iron and ironing board are provided in the unit. There is a king-size bed in the master bedroom and a queen and twin beds in the guest bedroom. Valet parking is available but at a separate fee for 24-hour periods (anytime in/out privileges) or $1/hour at the marina public parking. Oahu's island wide public transportation (The Bus) has a stop near the building porte cochere and across the street. Numerous shops and restaurants are located in the lobby and nearby surrounding areas. The world famous Ala Moana Shopping Center (the world's largest open-air shopping center with 2.4 million sf of retail space. Anchored by Bloomingdale's, Neiman Marcus, Nordstrom and Macy's, the property is home to over 340 stores and restaurants, including an extensive selection of international and luxury brands, one-of-a-kind specialty stores and more than 80 dining options. The center is also one on Hawaii's most frequented destinations, attracting 48 million shopping visitations each year. Ala Moana Center is located at 1450 Ala Moana boulevard, Honolulu, Hawaii 96814. The entire family can get in the water at the protected beach area to rent a paddle boat, paddle board, kayak or other water vessel to exercise at your leisure or perhaps just maybe just a swim or dip in the water. 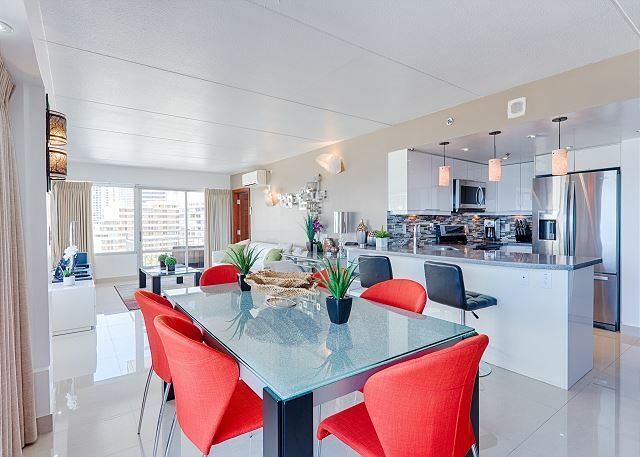 See why the Ilikai Apartment Building has earned a reputation as one of Waikiki’s premier properties. See you soon! We spent 5 nights and that is the most clean condo we stayed with. 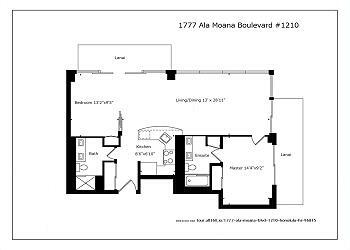 Very convenient location both to Waikiki and Ala Monana Center. Extremely clean, spacious, modern, second bedroom great idea with a queen and a single bed to accommodate for the extra person if need be. Two bathrooms a plus. Kitchen and fridge are all that you could ask for. air conditioners are very efficient and work quickly so as there is no need to leave running whilst you are out like a lot of people do, they cool down real quick, even to the point that you don't need to run during the night, at least whilst we stayed. Little extras that could be beneficial that would help all travellers are things like a bottle of cooking oil, salt & pepper was provided, but salt was out, dishwashing tablets and maybe a starter pack like water/milk and some basic fruit. This could even be an additional charge and a choice at the start to select if required. All in all an A+ accommodation and would recommend to anyone. a small walk to a major shopping complex just under 1 km (800 mts), Beach is reasonably close, but to get to the main beach in Waikiki it is a good 20 minute walk. First impressions were great but when our daughter and son-in-law arrived it didn't work. The second bedroom is crammed with a queen and single bed, so a tiny wardrobe and only one drawer with the sliding door to the lounge going along the foot of the bed. They had to move out so very disappointing when we wanted to be together. No cleaning service or products provided. I will preface this review with glowing accolades for design and decoration of the unit as well as great views off the balcony. The decor and atmosphere in the unit are very inviting and relaxing. It is also very clean and well kept. We loved the proximity to the lagoon as well as the ocean and Waikiki beach. Only a few minutes walk to the lagoon and about a 20 minute stroll down the beach to Waikiki and some great body surfing. The unit also had some great beach accessories on the balcony for use which came in really handy such as chairs, beach toys and beach umbrellas. I said I would start this review with glowing accolades, but must now review what we did not like. I will state this part has nothing to do with the unit itself, but just the Ilikai in general. Being that the condos are getting older there are a lot of units being renovated and restored which amounts to a lot of construction noise. We unfortunately experienced this right across the hall from our unit during the week we were there. Let me tell you that jack hammering reverberations throughout a unit while on vacation is one of the quickest ways to ruin your day. Fortunately for us that only lasted 50% of our stay and the rest of the noise was just basic pounding and hammering. 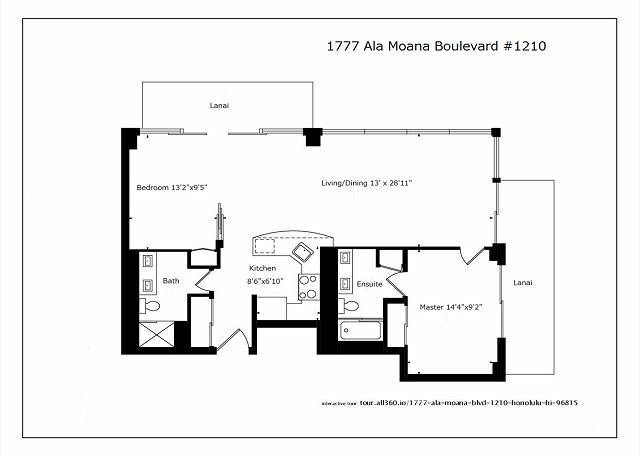 I will advise anyone staying not just at this unit, but the Ilikai that you ask your rental agency or owner of the condo if there will be construction near your unit prior to booking as the tenants are given notice of construction prior to work. Given our misfortune with construction Derek from Myland Realty was very prompt in coming by to see if there was anything they could do to help. I will finalize this review with high remarks of the unit and would recommend anyone to stay here especially because construction across the hall will be completed by now. Lastly, know that parking at the Ilikai is $28 a day, but buses and trolleys from all around the island pick up here so you don't really need a car. When we arrived there was large pile of dirt that had been swept up in the corner but not removed from the floor in the kitchen. The suite was clean, but this lack of attention to detail was somewhat disappointing. For one night of our stay we were unable to access the suite as the batteries were dead in the door lock panel. A bit of an inconvenience as security was not able to help us. We actually had to purchase new batteries to replace in the door so we had no additional problems entering the suite during our stay. Unfortunately timing for us - might be a good idea to leave spare batteries in the suite. Only 2 rolls of toilet paper were supplied in each bathroom, and 1 roll of paper towel. This was not enough for a family of 5 for a full week. Based on the price we paid for the week - enough of these items should have been included in the suite. The suite description should include a note that the laundry facilities are located down the hall with the cost per wash/dry. US$5.00. The balcony was not very clean (bird poop / sand). The lawn furniture has been aged by the sun. This is not reflected on the pictures on the website. It would be nice if there was coffee and a few essentials included in a "welcome package" to make the first morning a bit more carefree. It was disappointing that we were unable to use the fitness centre. The vacuum cleaner needs to be replaced as the one provided does not work well. The welcome letter informs you that anything beyond one load of laundry may incur additional charges. We washed ALL our bedding and towels upon leaving to avoid any charges above the already paid cleaning fee. The cleaning requests are a bit unfair considering the cleaning fee that is charged. Overall the suite was clean, however for the cost we paid for our week stay we were a bit disappointed overall. All so easy, from booking through to arrival and departure. Great communication throughout and gorgeous apartment with all amenities as specified. This unit is great and suited our family of 4 to a tee. 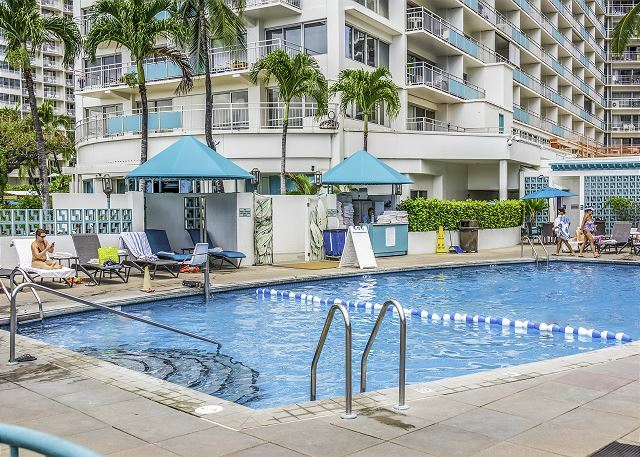 We were in Honolulu for a family reunion and had 3 units at the Ilikai - this one was the best :) It is well equipped and the view is beyond compare. The check in process was a breeze. The unit was immaculate. The views were breath taking especially the was quiet as well which I appreciated. The kitchen was fully stocked with dishes and cooking utensils. I did have a problem with having to provide my own toilet paper & paper towels for my week long stay. Seems petty but, had I known they only provide one roll for a week long stay then I would have brought from home. Never in my travel exp have I had to provide my own toilet paper. The welcome letter informs you that anything beyond one load of laundry may incur additional charges. So we washed our bedding and towels upon leaving to avoid any charges above the already paid $300+ plus cleaning fee. I wonder what they do then for $300 cleaning fee, lol. Over all I loved the unit and would stay again. Just disappointed in a few issues that were new to me. I will bring toilet paper, paper towels and allow time to do their laundry before I leave. 2 points to make only...unable to use fitness centre and the cleaning rates should be judged on what state the property is left in. Fee is quoted and could be higher if left in a 'dirty' state. I would like to believe we left the property in almost as clean when we arrived so feel the future of over $300 was excessive. Very well located, really comfortable beds and sheets, everything worked perfectly and very good cleaning condition. I definitely recommend this place! We had a good vacation. Stayed for 3 nights. Nice building and good location, within walking distance to beach, shopping, dining. We were under the impression that parking was included, but it was not, so valet was $28 per day. The hallway did smell rather musty. The unit was very nice and comfortable. Good beds and nice lanai with beautiful view. The warmers on the toilets were nice. The battery in the smoke detector died in the middle of the night. It was continually chirping and we had to disconnect it from the wall because there was no 9V battery to replace it. Overall, a good stay, but a little pricey. This apartment was perfect. Exactly like it shows in the pictures. Often pictures look better than the real thing. Not in this case. Everything was catered for & the views were stunning. Booking was easy & check in too. Ilikai is a great location for your holidays in Waikiki. Especially if you stay in an apartment with a view over the marina and the blue water of the ocean. It is simply awsome! We enjoyed a three night stay here. Apartment was immaculate, beautifully decorated and exactly as pictured. Wonderfully comfortable beds high quality furnishings. Great location, bus and trolley stops right outside property. Lanai perfect for enjoying sunset and early morning coffee. Would absolutely stay here again. Overall, our stay at this location was excellent. Very friendly and accommodating staff. Great location near the beach and shopping centers and restaurants. The room was upgraded from top to bottom with modern appliances and decor. Huge balconies to enjoy the beach and marina views and cold AC. My only complaint is that the master bedroom has a door that locks and no key is provided. We accidentally locked the door and had to pay $125 for a locksmith. Still trying to recover that extra cost. Other than that, i would stay there again.